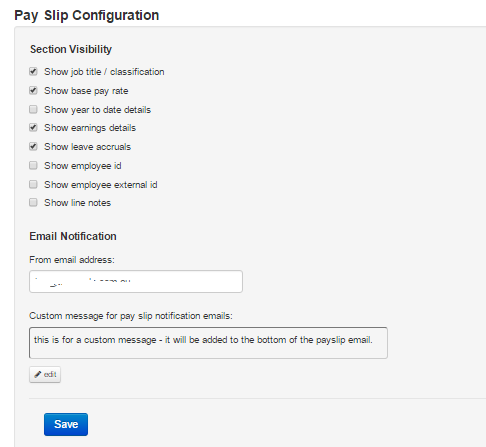 This feature allows you to customise play slips generated for your employees. A second window will pop up, click the green button that says "Select File". You are then able to browse your computer files for an appropriate image. Note: Images must be .gif, .jgp or .png, and we recommend dimensions of no larger than 150px by 350px. Email Notification "from email address" - specify this to set the "from address" that emails are sent from. This is handy for when employees want to reply to their pay slip with questions or queries regarding their pay. N.B: Due to email security settings and the likelihood of emails not reaching employees because of such settings, we ignore the following email domains: yahoo; gmail; googlemail; outlook; hotmail and bigpond. If any email address entered in this field uses any of these domains, the email address setting will be ignored. Rather, the pay slip email will be sent from support@yourpayroll.com.au or the email address set at the white label setting.